Slivers of sunlight reached through the vertical blinds and warmed my legs as I rolled over. Spring crickets sang their overture and the scent of blueberry pie wafted over me before the . . . smoke? My eyes popped open like a toaster. “Just a little burnt toast, I’m sure. Happy Father’s Day, honey.” She kissed my cheek and left to supervise. I lay in bed trapped, waiting for breakfast. Didn’t they know I only drank coffee in the morning? A dot of milk with no sugar. Strong and bitter. I wouldn’t feel like eating till twelve, at least. I wiggled my toes out of the sheet so they could breathe in some fresh air . . . and waited . . . read a chapter of Dr. James Dobson’s Bringing up Girls. And waited. Six and ten year-old size footsteps pitter-pattered down the hall toward my door. Then a knock loud enough to shatter my bones. “It’s open.” I got up to help since their hands were full. “What’s this?” I looked as surprised as ever. “We made you breakfast for Father’s Day,” Sandy answered. “We have a few courses,” added Laura. “Wow, you shouldn’t have gone to so much trouble.” I kissed the tops of their heads and smelled strawberries. Hmm. Shampoo or jam? I propped up a few pillows, set the tray over my lap, and examined my first course. Pancakes bursting with color. “They sure are colorful.” My beautiful daughters stared at me with wide grins, waiting for me to take a bite, I supposed. I sawed off a tiny red and green piece and hoped to swallow without tasting, but the sweet flavor lingered. “Mmmm. Delicious. Guess I’ll wash it down with this super dark chocolate milk you made.” I could see about one inch of syrup settled at the bottom like mud. As soon as they closed my door, I scanned the room. How could I dispose of the rest? My sock drawer . . . nah, I’d have rainbow streaked socks. Jill’s jewelry box? Not a good idea. Under the bed wouldn’t work—Rex might get sick eating too much junk food. I mean “breakfast.” He was already drooling and waiting for me to toss him a bite. “Here’s your cereal,” said Laura. “We’ll go get the last course ready.” Laura shut the door. I was glad to hear the end was near. I mustered the courage to take one mouthful. Sugar and dye—the breakfast of champions. My stomach wasn’t ready for artificial garbage, so I poured it out the window. I hoped it wouldn’t poison any birds. This time they charged in without knocking. “Here’s your dessert,” said Sandy. They hopped on the bed and stared at me as I stared at the toasted Poptart. The first bite sent shivers down my neck. Sweet blueberry with frosting and sprinkles—who creates this junk? A ten year-old CEO? And worse yet, I bought this junk. 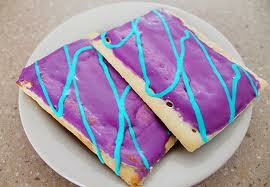 I ate every crumb of that purple Poptart and washed it down with a tall glass of ruby red Hi-C Punch. They smiled, so proud. I smiled and hugged them. This was the worst and best breakfast I ever had—made from my daughters’ sweet hearts.